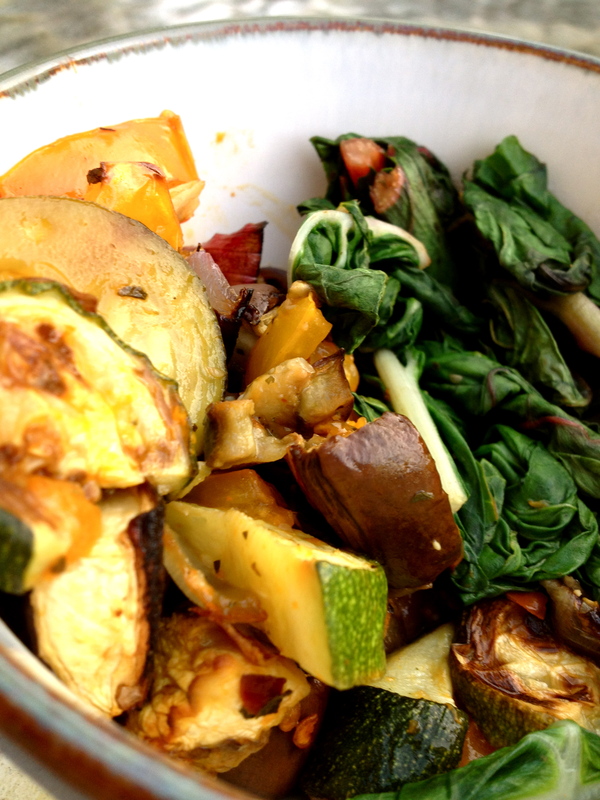 Simple End of Summer Italian-Style Roasted Veggies – .rebel grrrl living. If you couldn’t tell from the amount I’ve been eating it, eggplant is is season right now. And because we have the awesomest pals in the world, we were given two CSA boxes in the past couple weeks, and both boxes were eggplant-heavy. 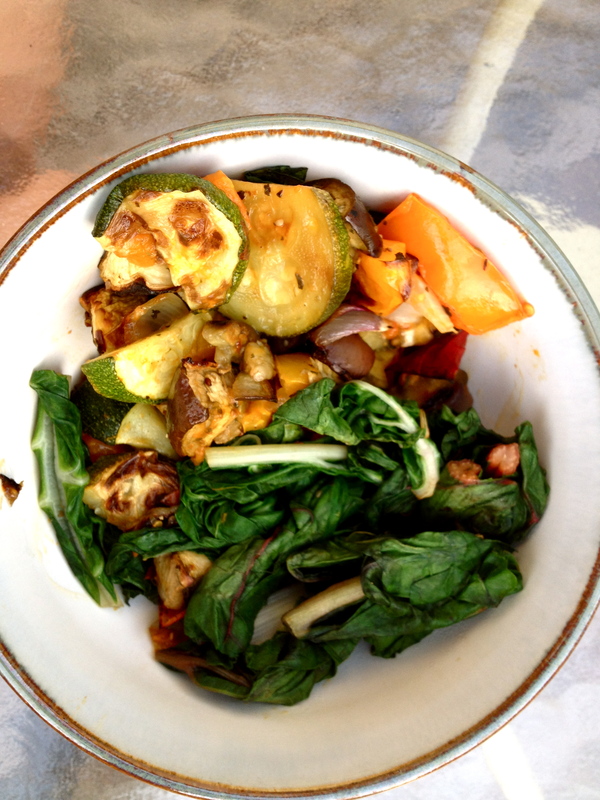 I was avoiding eggplants–and all nightshade vegetables–for a while, but fortunately, this meal didn’t upset my tummy in the least. On the contrary, this meal made my tummy mega-happy. The savory Italian flavors were rich, but not heavy like Italian food can sometimes feel. 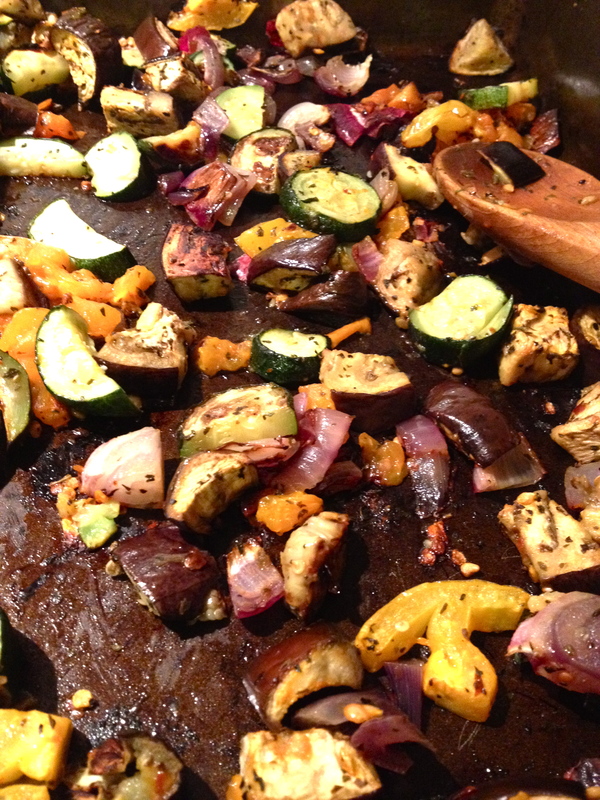 All we did was chop up a bunch of veggies from the box, drizzle them with a bit of EVOO, and add some spices. I didn’t do exact measurements, but really just use your best judgement/taste buds to guide you. Preheat oven to 405. Chop your veggies (minus greens) in bite-size pieces. Put in a roasting pan. Drizzle with olive oil, add your spices, and mix it together. Let roast for at least 30 minutes. In the meantime, blanch your greens in a pan—-add a bit of water to a pan on the stove top, and cook until wilted over medium heat. We enjoyed this truly delicious meal on our back porch, with this album playing in the background. Ah, sweet summer. Mmmm veggies at their finest. I had a meal very similar to this one a few nights ago and I thoroughly enjoyed every bite! I’m going to miss summer veggies! Gorgeous! I’ve been digging on eggplants recently too, and zucchini always. Love the extra greens you threw in with it. So pretty. Sometimes the simplest things are the best :) This looks great!